Black Makeup Train Case 2029 Free Shipping pro-makeup cases [2029B] - $49.99 : MegaDiscStore, Your choices of High quality CD DVD Blu-Ray Replace cases! 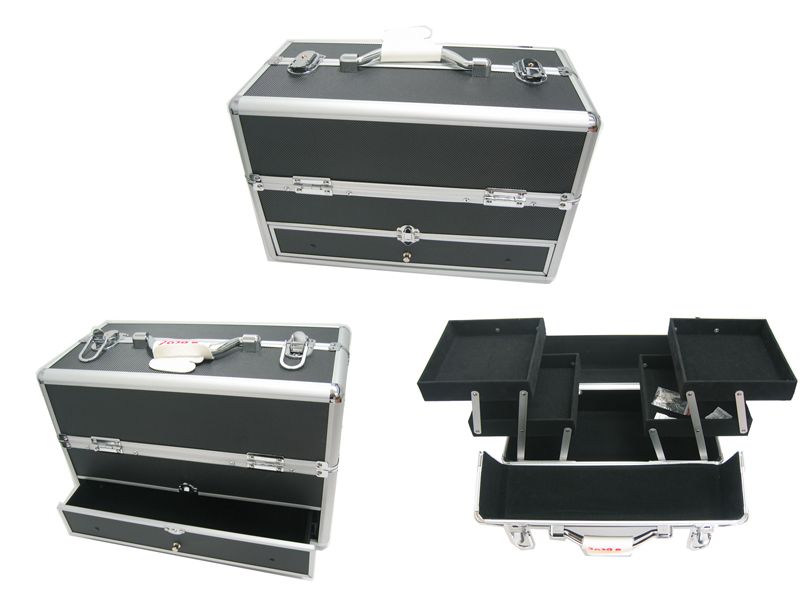 This Medium Makeup Case is expertly designed to organize and transport Makeup Brushes, Makeup Tools and Accessories. This classic design features four tiered trays and a large lower compartment for ample storage, a drawer at the bottom of the case can hold small bottle cosmetics or brushes separately. The convenient foldout accordion style trays allow for easy access to all levels of the case. The hard outer shell and over locking snap-closure, ensures your beauty essentials travel securely! This Makeup Case Makes a Great gift for you, your family member or your friend! * Double Sided 4 Tier trays. * Silver aluminum frame construction. * Black color ABS panels surface. * Chrome strong handle on the top of the case. * Two chrome padlock with two sets of the key.